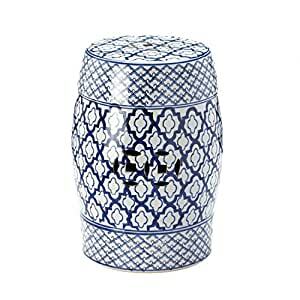 This decorative asian ceramic stool blue will add classic oriental beauty to your room. The blue and white ceramic stool weighs only 16.5 pounds, easy to move. The blue patterns of the chinese ceramic stools blue in your room will make it more attractive. The round ceramic stool decorated by blue and white will not take up a lot of space with its 6″ diameter bottom. White and blue decorative ceramic stool dimensions: 13″ x 13″ x 17.5″; small ceramic stool weight: 16.5 pounds.